One of the more interesting things about recent political events in Chicago has been an editorial comment published in the October 10, 2014 Chicago Tribune regarding Karen's health -- and then breaking with the Tribune's general anti-union bias, the editors got personal. And full of class. When will we have Karen Lewis to tussle with again? And not just those of us on our editorial board. Many Chicagoans want to be in a rope pull with you � some on your end of the rope, some on the other. You are nobody nobody sent. But you've made yourself essential to the debate in this metropolis � to almost any debate, that is, about Chicago and its children, its schools, its finances, its direction. You're not yet a week in the hands of a medical team and already we miss you. Many of your fellow Chicagoans have survived their own serious illnesses � turbulent times of crisis but also of epiphany. Serious illness is an efficient teacher (although, we acknowledge, not a dues-paying member). Sometimes it teaches gratitude. One of our colleagues never will forget his own road to recovery, which ended with a Chicago-area surgeon named Tony DiGianfilippo murmuring, "You've become an uninteresting patient. No need for another appointment." Come back when you can � to see if we got the job done, or if we need remedial chemistry from Chicago's lead teacher. has sources in our soup,I am sure by now they know what is wrong with Karen. One of the two major proclaimed mayoral candidates at this point (Bob Fioretti) successfully beat cancer, as those who have long known and admired him know. Whether or not the Chicago Tribune knows "what's wrong with Karen," the fact is that all we need to know (as members of the Chicago Teachers Union) is that Karen Lewis, supported first by her family and close friends and more broadly by thousands (or more admirers) is that Karen has a "serious illness" that she is successfully facing and fighting. The Tribune's brief moment in support of a fierce activist for justice was worth noting -- especially now since it came just three days before the Tribune blared from page one that it wants voters to vote for Bruce Rauner. Ironically, the depletion of the reportorial ranks of Chicago's "news" organizations has left them bare and bereft. In 1987, the Tribune could send a top international reporter (in Chicago to kick back before going back overseas) to track down the "militant high school teachers led by some guy named George Schmidt) and explain why Jackie Vaughn was still leading a strike after the end of the strike's second week. Liz Sly got that story by sidling up to our friends in a bar and getting almost everyone to talk -- talk, talk. Top notch Chicago reporting, resulting in a major story about how those "militant high school teachers" were a force in the CTU. Now it's 2014, and the reportorial skills at Chicago's corporate news organizations are severely diminished. 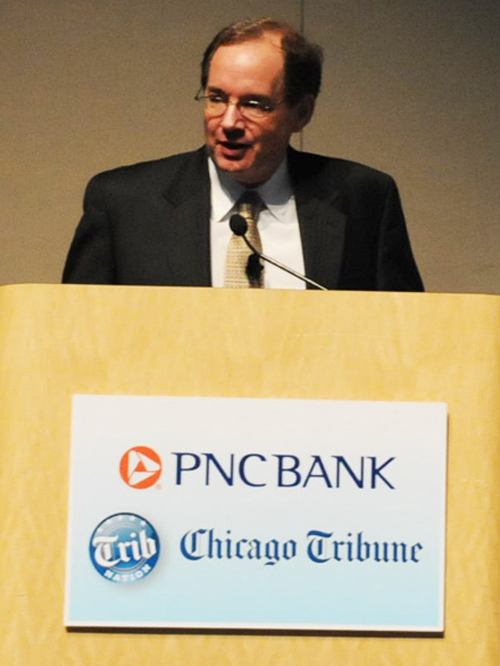 The Sun-Times is a joke; the Tribune, having survived Sam Zell though, is not far behind. Both (and all the other corporate "news" outlets) have abolished their farm systems and stripped their benches (to celebrate the post season in baseball with a metaphor). So in 2014 they don't have a reporter who is enterprising enough to chase down George Schmidt, as Liz Sly was in 1987. And so, they are also unable to chase down the "facts" of the current Karen Lewis story. But really, all anyone should want to know is that Karen is fighting, with her usual fierceness, a "serious illness."